Fall is my absolute favorite time of year. I love the crisp smell of fall air, the changing leaves, the dusky light, and the falling temperatures. I cannot wait until I'm settled in a place that experiences the proper season--I'm counting down the days until September! More than that, fall is my favorite season to dress for. I love the darker colors, the heavier fabrics, and the fact that so many classic pieces always feel just right for the season. This is my list of basics for the season; a starter wardrobe, if you will. With these pieces, it's so easy to mix and match and add items on, and these pieces are easy to layer for the cooler days. 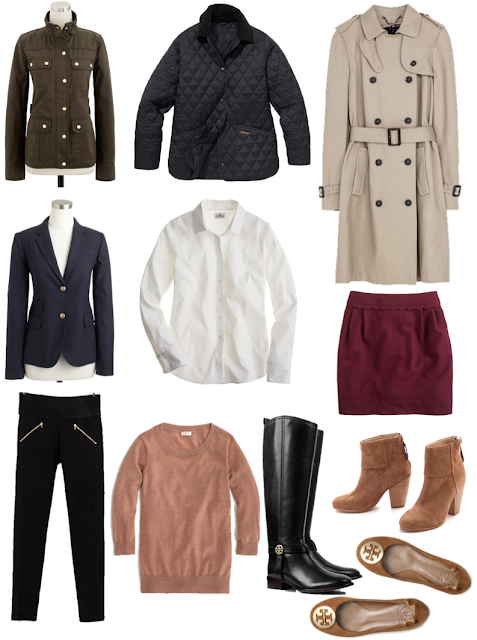 What are your fall wardrobe basics? Are you as excited for the season as I am?